LEWISTON, Idaho -- The panorama from the summit of Lewiston Hill just might take your breath away. From an overlook more than 2,000 feet above the confluence of the Clearwater and Snake rivers, the view is at once soothing and dramatic. Green hills fall like crumpled velvet to the banks of the two streams. The twin cities of Lewiston, Idaho, and Clarkston, Wash., roll across the opposite shores. Residential neighborhoods rise on wooded hills above riverside downtowns, which are linked by several bridges. To the south, just out of sight, is pure wilderness, some of the most rugged terrain on the North American continent. Only a few miles out of view, the Snake River emerges from Hells Canyon. Half again deeper than the Grand Canyon, this parched gorge is home to bighorn sheep, golden eagles and rattlesnakes. It is the heart of a national recreation area much loved by whitewater rafters and seasonal hunters. It had been my intention, on this visit to Lewiston, to explore miles of the Snake by jetboat. 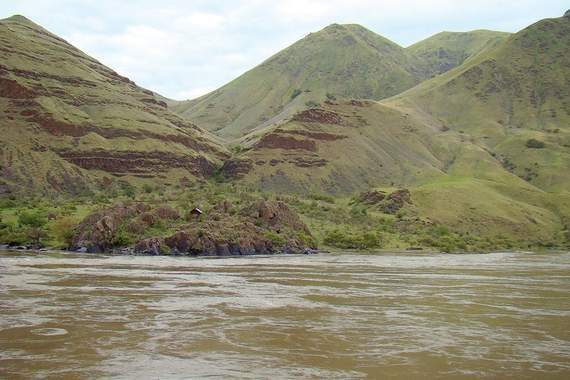 At least a half-dozen local outfitters run the 76 miles of river south to Pittsburg Landing, and some continue an additional 32 miles to the Hells Canyon Dam. But I was told that high water, caused by spring snowmelt, carried snags and other debris that made the river unsafe for the jetboats' water-intake engines. So instead of spending a day or two on the river, I made an abrupt change of plans. I chose to focus not on the area's geology and natural history, but upon the human history that created the modern cities of Lewiston and Clarkston nearly 400 miles northeast of Bend. Lewiston, by far the larger of the two with 31,000 people, was founded in 1861 as a river port from which Rocky Mountain gold could be shipped to the mouth of the Columbia River. But its roots, along with those of neighboring Clarkston (population 7,200), may be traced to the famous explorers after whom they were named -- Meriwether Lewis and William Clark -- and to the Nez Perce people whose presence preceded them by thousands of years. I found Lewiston to be a perfect base for learning about both the early-19th-century pathfinders and the history and culture of the Nez Perce. From museums and interpretive centers to roadside markers and historic sites, there was plenty to be discovered about the Corps of Discovery and their Native American friends. On the riverbank where the Clearwater meets the Snake, beside a U.S. Army Corps of Engineers memorial to the explorers, a marker notes the location in modern Lewiston where Lewis and Clark established camp on Oct. 10, 1805. Only three days earlier, they had departed their so-called Canoe Camp 38 miles up the Clearwater. Hungry and exhausted after encountering early snow in their crossing of the Bitteroot Range of the northern Rocky Mountains at Lolo Pass, they had been revived by gracious Nez Perce Indians at a village four miles west of present-day Orofino. During a 1-1/2-week stay, they built five dugout canoes for their voyage to the Pacific, leaving their horses in the tribe's care until they could retrieve them the following spring. One month later, the Lewis and Clark expedition reached the Pacific, where they wintered at rainy Fort Clatsop. Returning upstream in April, they fell back upon the hospitality of the Nez Perce when they were again challenged by mountain blizzards. The expedition stayed a month on the Clearwater -- near what is now the town of Kamiah, 66 miles east of Lewiston -- at a meadow they called Long Camp. Historical signs at Canoe Camp, Long Camp and other sites document the party's travels through the Clearwater corridor. The explorers finally crossed the mountains in June and concluded the journey at St. Louis in September 1806. Part of their success may be ascribed to the Shoshone woman known as Sacajawea. The wife of the party's French-Canadian interpreter, the young mother accompanied the corps of three dozen adventurers from the Missouri River to the Pacific and back. Her ability to ease tensions with potentially hostile tribes, as well as her knowledge of natural landmarks, enabled the expedition to build relationships with the native peoples they encountered. In Lewiston, in particular, Sacajawea's legacy is widely acknowledged. The central image of the Corps of Engineers memorial is that of a symbolic Native American earth mother that might well be fashioned after Sacajawea. And on the campus of Lewis-Clark State College, a highly regarded four-year liberal-arts institution in the heart of Lewiston, the newly constructed nursing and health-sciences building has been dubbed Sacajawea Hall in remembrance of the native woman's contributions. For the first generation after the passage of Lewis and Clark, life did not change dramatically for the Nez Perce. Although the Nimiipuu, "the people," had been labeled "nez percé" (pierced noses) by early French-Canadian fur trappers, that was never a trait of their plateau culture. They lived in clan villages in north-central Idaho, southeastern Washington and northeastern Oregon, gathering camas root from the prairies to supplement a diet rich in salmon and game. They traveled more widely to hunt and trade after domesticating horses in the 1700s. In 1831, four Nez Perce traveled to St. Louis to visit William Clark, then the director of Indian affairs for the federal government. The tribe had become impatient waiting for someone to teach them lessons from the "Book of Heaven," the Bible, described to them at Long Camp 25 years earlier. In response to their request, missionaries Henry and Eliza Spalding were sent west to establish the first Christian mission among the Nez Perce in 1836. The site of the township that grew up around the Spalding mission is now the location of the Nez Perce National Historical Park visitor center. The hub of information on the park's 38 separate sites in four states, this building presents a highly informative, 23-minute film on tribal history and culture. It also features a small but colorful museum of traditional crafts and tools. Instructional programs engage tribal members as well as curious visitors. Bessie Blackeagle, a young park ranger preparing for a summer posting at the park's Big Hole National Battlefield site in Montana, was painstakingly practicing tipi construction outside the visitor center during my visit. "This is not something I learned as a child," she confessed. Trails from the visitor center lead through the original town site to a cemetery, where Henry Spalding was buried, an 1876 Presbyterian church and a 1910 general store. About 15 miles south, in the isolated hamlet of Slickpoo, stands St. Joseph's Mission, a Catholic church. It was built in 1874 by Jesuit priest Joseph Cataldo, later the founder of Spokane's Gonzaga University. The Spalding site, 12 miles east of Lewiston, is near the west entrance to the modern Nez Perce Reservation. About 2,700 Nez Perce live in the 1,195-square-mile reservation, sharing it with thousands more non-native ranchers and loggers in towns like Orofino and Kamiah. The Nimiipuu call themselves the Children of Coyote. The reason became clear to me when I visited the Heart of the Monster, just south of Kamiah, one of 15 national historical park sites on reservation land. Nez Perce tradition abounds with stories about clever, no-nonsense Coyote, none of them so gripping as the one related here. A five-minute recorded audio presentation describes how Coyote's epic battle with a great monster led to the emergence of the Nez Perce people. Visitors can still see the monster's enormous heart, which Coyote cut out after being inhaled by the creature; use your imagination, however, or you might think it is a mound of rock. The Nez Perce reservation was established in 1863, as the U.S. government sought to buffer white settlements, including potentially rich gold claims, from the native population. Not all Nez Perce signed or even accepted the treaty, however. Some of them refused to leave their ancestral homes on either side of Hells Canyon in Idaho and Oregon. In 1877, conflict flared when the Army issued an ultimatum to the dissident bands. In the resultant Nez Perce War, 800 men, women and children followed chiefs Joseph and White Bird across four states for four months. They crossed 1,500 miles, only to be forced into surrender 42 miles short of the Canadian border at Bear Paw, Mont. Many of the associated sites are now part of the national historical park. There may be no site, however, more ancient than Buffalo Eddy. The distinct and densely grouped petroglyphs and pictographs -- the finest concentration I've seen in the Pacific Northwest -- are scribed on rocks on opposite banks of the turbulent Snake River, 24 miles south of Clarkston via the small town of Asotin. Their age has been estimated at as much as 4,500 years. A level trail leads a couple of hundred yards from a parking pullout to the historic site on the Washington side of the river. Some of the images obviously depict humans and animals, including deer and bighorn sheep; others are more abstract, with circles and triangles. Among the most obvious diagrams at this site are stick figures holding dumbbell-like objects, which archaeologists speculate may be paddles or rattles. Already at this point, I felt the walls of Hells Canyon closing in. A lone jet boat, the only one I saw all weekend, raced past me down the river. A pair of osprey observed me from a nearby nesting box. Across the river, I saw a lone cabin sheltered among rocks. I wondered how the owner got there. On the Lewiston side of the river, the nearest outpost of civilization is Hells Gate State Park, four miles from downtown off Snake River Avenue. Many of the jetboat outfitters begin their excursions from the marina here, adjacent to the 960-acre riverside park with its extensive campgrounds. Park headquarters are at the Lewis and Clark Discovery Center, which has displays on the intrepid explorers and a half-hour film on their impact. Just uphill, the Jack O'Connor Hunting Heritage & Education Center pays homage to O'Connor, a longtime editor of Outdoor Life magazine, who lived in Lewiston for 30 years until his death in 1978. The collection offers four decades of O'Connor's game trophies from Africa and Asia as well as North America. Downtown, I found exhibits at the Nez Perce County Historical Society Museum to be enlightening. They fill several rooms of the art deco-style Luna House, built in the 1930s on the site of an 1863 hotel. Lewiston was founded as a wild-and-woolly gold-rush tent village known as "Ragtown," I learned; but within two years it was the first capital of the Idaho territory. Although the boom didn't last long, Lewiston persisted as a hub for steamboat and stagecoach traffic, and later for the Union Pacific Railroad. The downtown historic district has a genteel charm highlighted by numerous brick buildings and public art installations. But the most intriguing sculpture is not yet on official display. Sculptor Christopher Fennell may soon complete "Canoe Wave," his welded tribute to Lewis and Clark, now resting behind a warehouse, beside railroad tracks near the Snake River confluence. You can see both rivers from the 10-square-block campus of Lewis-Clark State College, on the hill above downtown. About 3,500 students attend classes at this school, well-known to baseball fans as the home of the annual NAIA World Series. Every year on Memorial Day weekend, 10 small-college teams from all over the United States compete in a double-elimination tournament. L-C State is a perennial contender and a frequent winner. The school has produced 15 major-league baseball players, including current Seattle Mariners shortstop Brendan Ryan. During my visit, Lewiston's annual Dogwood Festival was under way and the college was hosting the "Art Under the Elms" crafts show on a campus quad. Ironically, there were no flowering dogwoods here. But the surrounding residential neighborhood had many trees blooming in beautiful pinks and whites. Each town has an outstanding hotel in close proximity to a craft brewer, something near and dear to the hearts of Central Oregonians. In Lewiston, the spacious and pet-friendly Red Lion incorporates MJ Barleyhopper's, which not only brews its own but carries 65 other beers on tap. In Clarkston's port area, the Quality Inn & Suites is a short walk from the Riverport Brewing Co., which offers great beers but nothing more than popcorn to eat. Fortunately, local favorite Fazzari's Pizza delivers. A fledgling wine industry is emerging in the Lewiston area. Next door to Riverport Brewing, Basalt Cellars is winning scores of fans for its merlots and other red varietals. And in north Lewiston, Coco and Karl Umiker, a microbiologist and a chemist, have put Clearwater Canyon Cellars on the map with its red and white blends. Easily my favorite restaurant in the area is the Sycamore Street Grill in Clarkston. My roasted duck entree with fresh asparagus and risotto, complemented by a bottle of Trutino cabernet-syrah blend from Walla Walla's Dunham Cellars, was the best meal I had in the twin cities. But I won't forget Effie's Tavern, whose hamburgers are so large they'll offer to cut them into quarters. Seriously. Before leaving Lewiston, I drove once more to the summit of Lewiston Hill. U.S. Highway 95, the main route toward the university towns of Pullman, Wash., and Moscow, Idaho, makes easy work of the ascent -- but it's nowhere near as fun as the original road. When the Spiral Highway was built in 1917, it was considered a marvel of modern engineering. A nearly continuous 4 percent grade falls 2,000 feet in a series of 64 curves over 9-1/2 road miles. And the view is unremittingly marvelous almost all the way to the bottom of the hill. I only wish it could have carried me a little further into Hells Canyon.